This page contains information only on carnivore species that I`ve managed to photograph and there are of course many more native to Namibia. 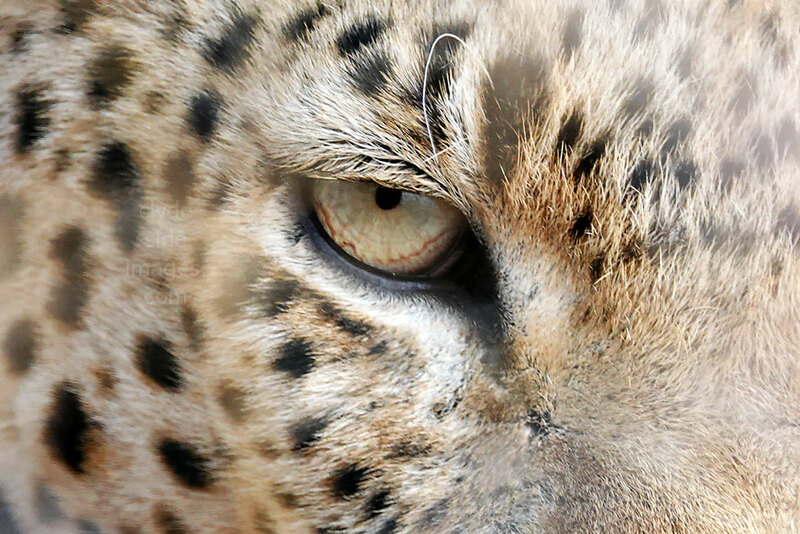 ​Big cats are amongst the iconic species that symbolise Africa and its diverse wildlife. They also play an essential role in maintaining ecosystems. The populations of all these cats are declining rapidly due to uncontrolled human population expansion and the resulting encroachment on their habitat which reduces their natural prey. Poaching, disease, unsustainable hunting, and persecution by farmers and herders are just some of the many challenges they face. ​​Figures on how many lions there are in Africa today vary wildly, but what's clear is that numbers have decreased by around two-thirds in the last 50 years. According to the Africat Foundation there are just 600 to 800 wild lions left in Namibia, all in the north of the country. Between 250 and 750 lions live in Etosha National Park while smaller populations exist in the Caprivi, Bushmanland and in Kaokoland. Also, these big cats have recently returned to the Skeleton Coast Park. 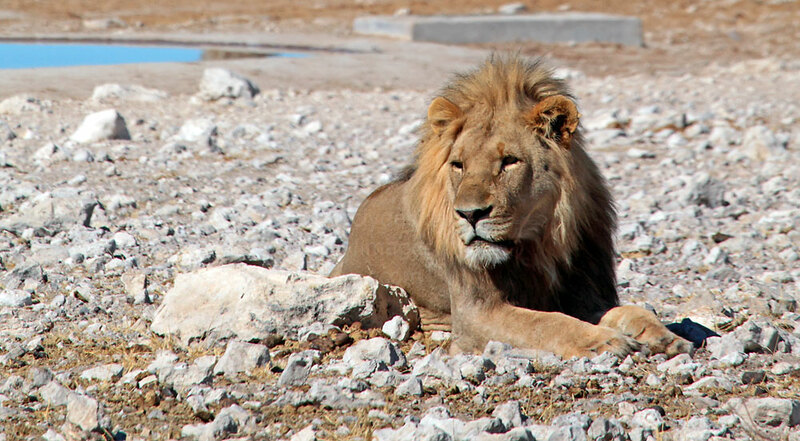 Lions spend much of their time hunting, patrolling territories, playing and sleeping. Although they live in prides of up to 30 individuals usually comprised of between four and a dozen related females, it`s the females that remain in the pride for life. 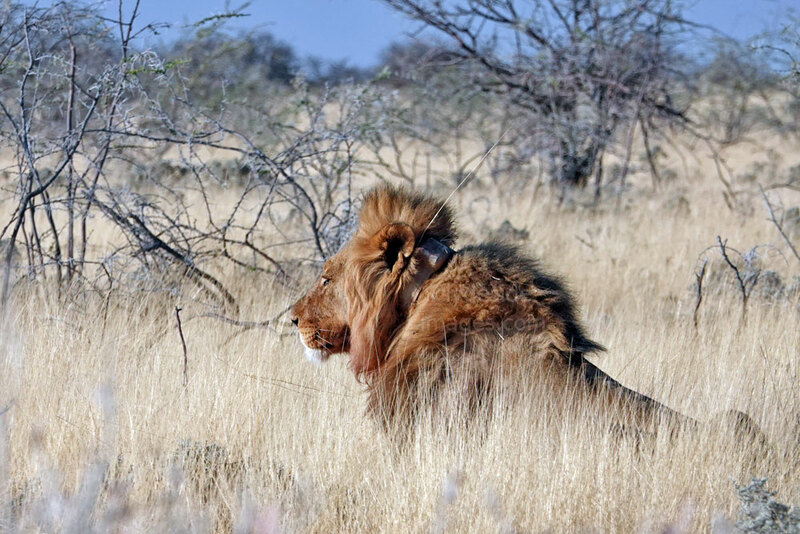 Young males will leave the pride and become nomadic when they reach 2 or 3 years old, returning at the age of 5, when they will settle down with their own pride. 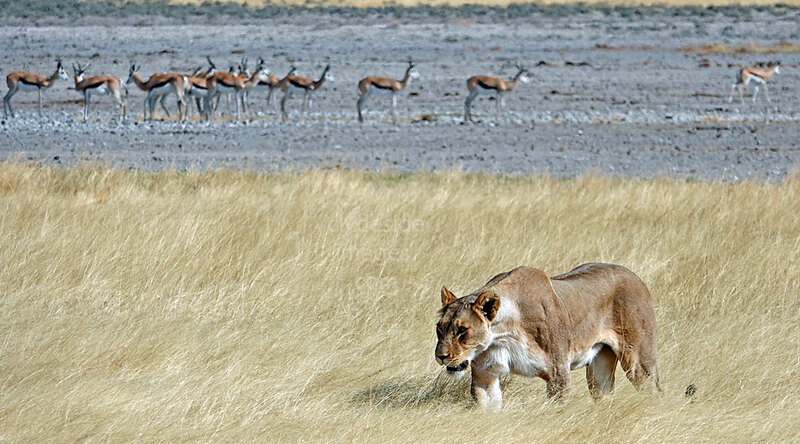 Females do the majority of the hunting, working as a team, but male lions often form coalitions to either defend their lionesses from rival males or take-over other prides. Lions feed on a wide range of mammals from mice to buffalo, birds up to the size of Ostrich as well as reptiles and even insects. Attacks and kills on Wildebeest, Giraffe (above), Oryx (Gemsbok) and Zebras are common and they are also known on occasion to tackle young Elephants and Hippo. Further information on Namibia and additional images taken there can be found on Clydeside Images.com. Utilise the blog`s search box or the `Overseas-Namibia` fly-out label on the right-hand side of the blog page. Please bear in mind that my Stock Photography Archive has even more shots taken in Namibia. If you wish to purchase any image(s) please email using the Contact Form and I will respond at the earliest opportunity. Please bear in mind that all my images are subject to copyright. They are not free to use and have been embedded with a digital watermark. ​Back in February 2018, two young male lions escaped from the National Park, killing three oxen and a dog in a nearby village although no humans were harmed. 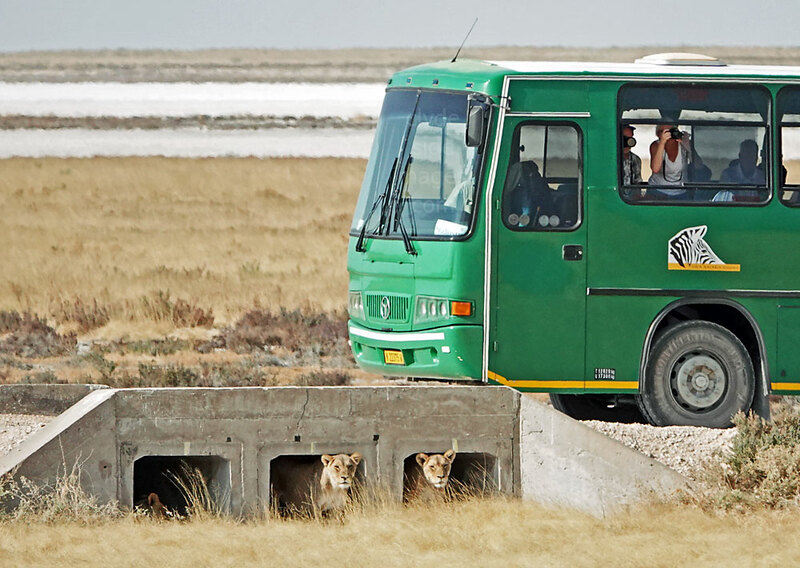 Following an intervention by officials from the Ministry of Environment and Tourism, one of the lions was killed after it reportedly showed signs of aggression and resisted all attempts to capture it. 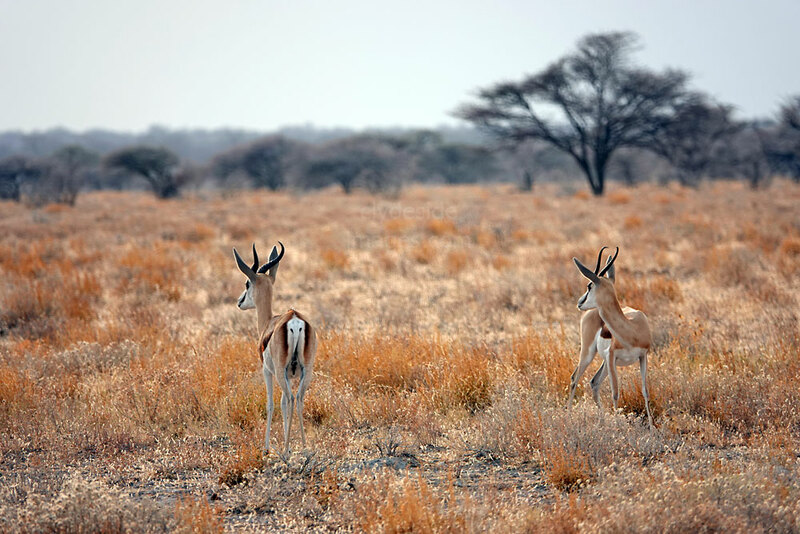 Human-wildlife conflict is a pressing and complex issue in Namibia as it is in many other parts of Africa, with growing human populations inevitably encroaching on animals’ habitats. The whereabouts and fate of the other animal is unknown. ​Leopards (Panthera pardus) are magnificent creatures, and live a mainly solitary existence, except during the mating season or when females are accompanied by juveniles. Although they are primarily nocturnal, they are often spotted during daylight hours, particularly in national parks and in remote areas, but despite spending a great deal of time in Etosha, this individual on my last trip was my only sighting. It was resting alongside Dik-Dik Drive close to the Kleine Namutoni waterhole. 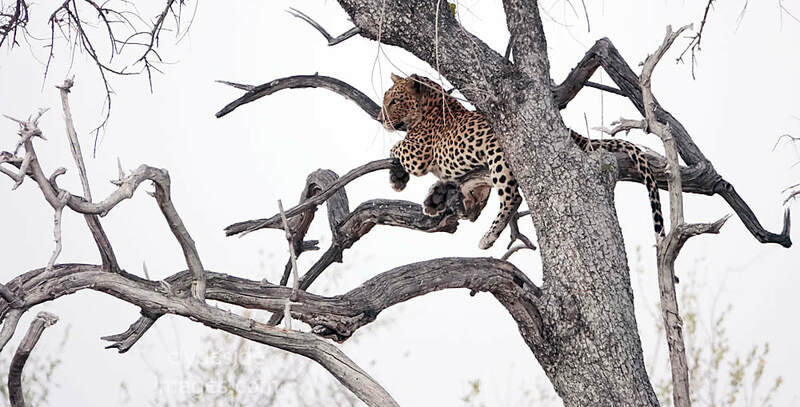 They are agile climbers and It`s common to see a Leopard like this, draped across the branches of a tall tree, sometimes guarding a kill. 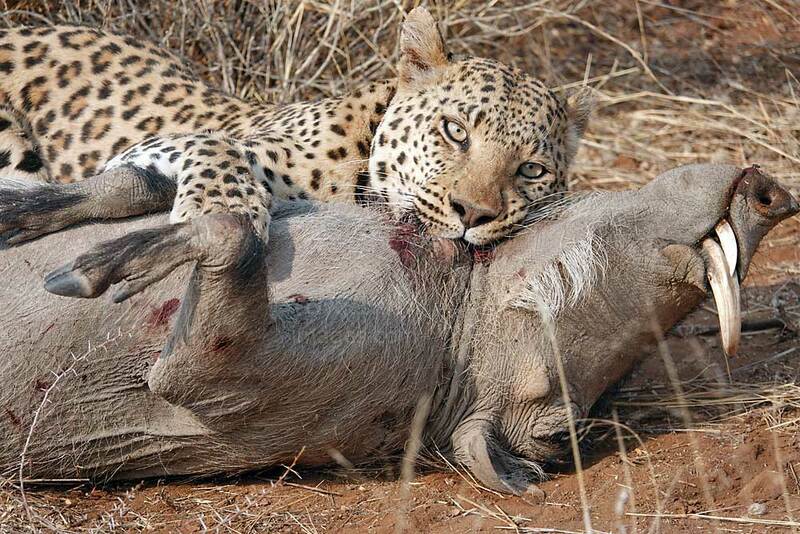 When there`s competition from other predators, especially lions, the carcass will be cached out of reach. Male Leopards defend large territories which overlap the territories of two or even three females, who defend their territories against other females. Their hunting technique entails stalking and pouncing, killing larger prey with a holding bite to the throat which suffocates the victim. Smaller animals are killed by a bite to the back of the neck which usually severs the spinal cord. Plucking fur off the carcass follows, before feeding on the softer parts of the body. The remains of the catch and stomach contents will be covered with grass and sand. Although no other wild cat is spread over such a wide range or with the diverse prey base as the leopard, it is still under threat in many regions. Once common in all parts of Africa apart from the deserts of the Sahara, it has now disappeared from most parts of northern Africa, apart from a few widespread areas of the Atlas Mountains, and is scarce in the extreme west of the continent. The Okonjima Nature Reserve offers Leopard-tracking trips and I`ve been very lucky twice, seeing a mother with her cub on my first stay, then witnessing a kill which although fascinating, was not pleasant to watch. 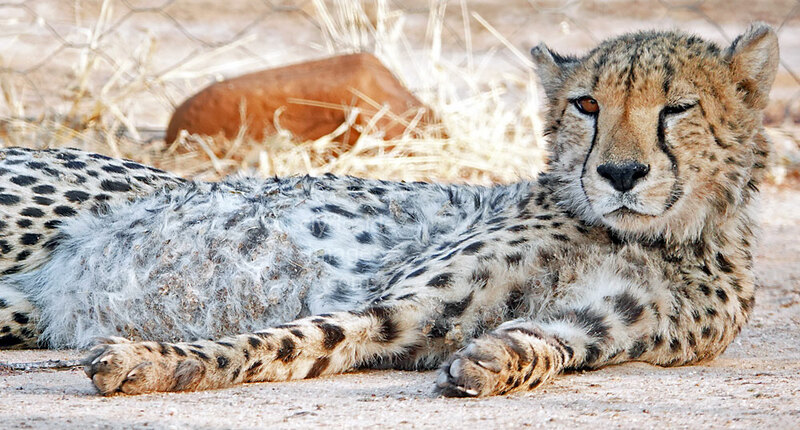 ​In Africa some 7,500 Cheetah still live in the wild today and of these Namibia has the largest population. A conservative estimate puts the figure at around 3,000 of which 95% live outside protected areas, mainly on farmland. 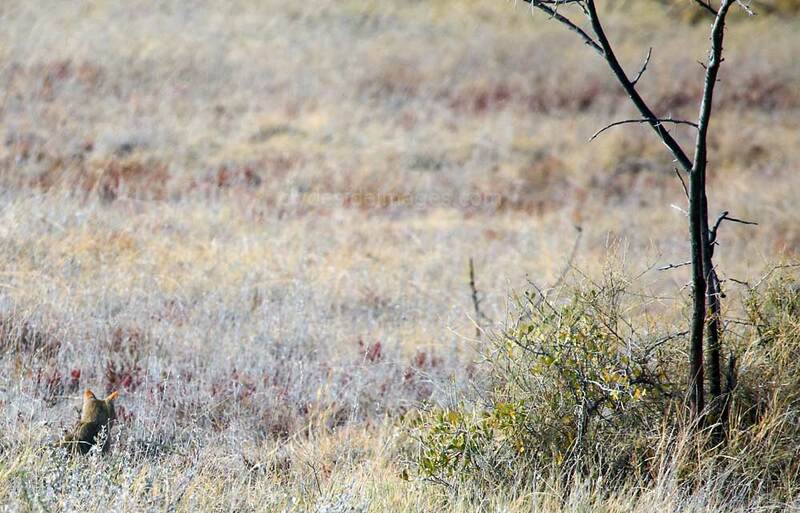 It's thought that less than 50 Cheetah live in Etosha with this total declining every year. They`re unable to compete with lions for prey and are particularly prone to the naturally occurring disease anthrax which is mainly contracted by eating infected prey. ​On my last holiday, I pulled over to photograph this Cheetah and her three cubs as they scanned the surrounding terrain for breakfast. 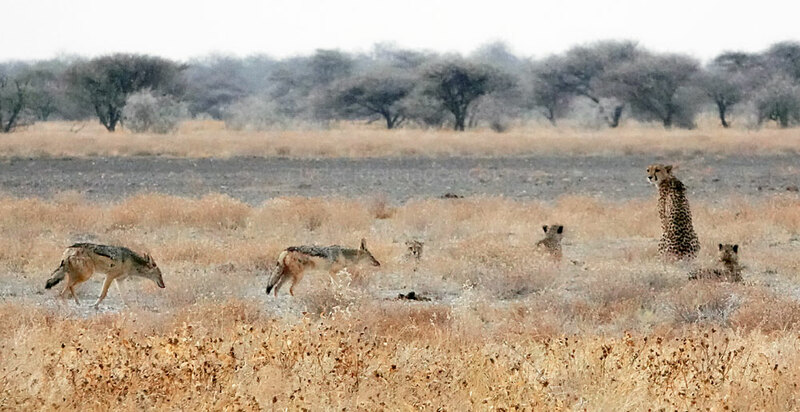 Within minutes, a trio of Black-backed Jackals joined them at their lookout spot and surprisingly neither mother nor offspring seemed phased by their presence. There didn't seem to be much in the way of potential prey around for the sleek adult cat but it stealthily moved forward, with the cubs copying her every move. The Jackals followed on. She eventually launched at a Springbok but the accompanying Jackals, in full view, set alarm bells ringing. 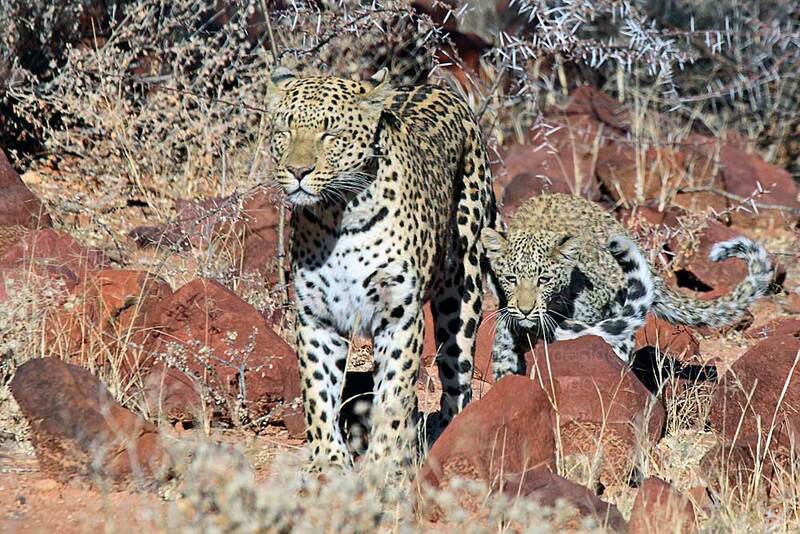 Mother Cheetah and cubs all sprinted after the fleeing antelope but it made good its escape. One of the best places to see these magnificent cats at close quarters is the Okonjima Nature Reserve, home of the Africat Foundation. Sightings here are more or less guaranteed as these are all rescued animals and any individuals free to roam across the bulk of the reserve have all been fitted with a tracking collar. 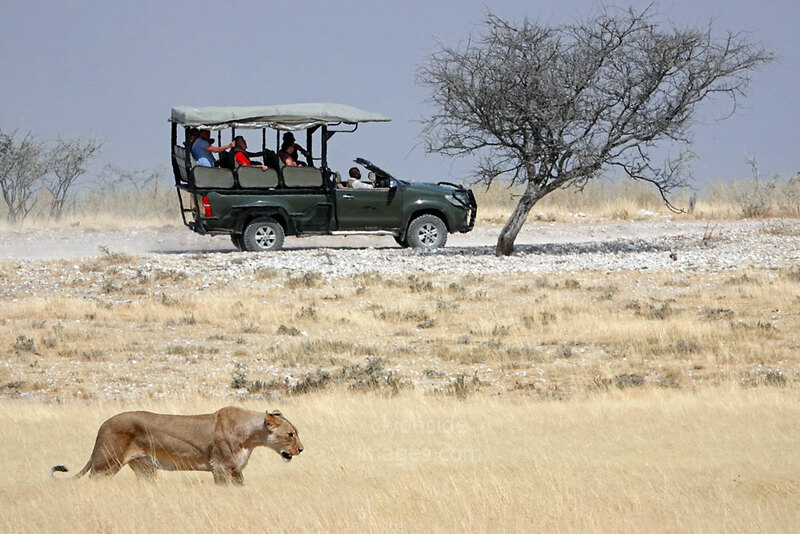 ​Leopard tracking is also on offer and having stayed here twice, I can`t rate the overall experience highly enough. Additional information and some excellent photos can be found on Okonjima`s official website. ​The Spotted Hyena (Crocuta crocuta) is far more common than the Brown Hyena (Hyaena brunnea), also known as the Laughing Hyena, and it can be distinguished by its more rounded ears as opposed to the pointed ears of the latter species, and a shorter, less shaggy coat. The distinctive pattern on the Spotted Hyena`s body is usually obvious, except in very old individuals. 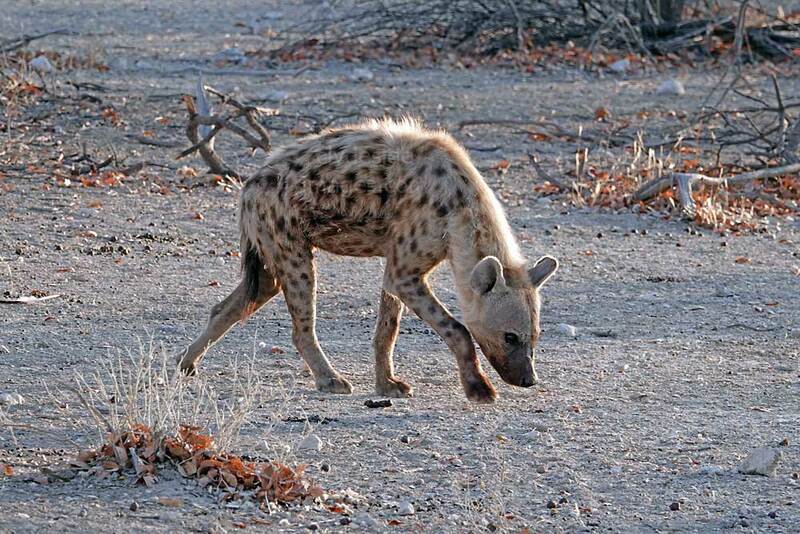 Spotted Hyenas were once widespread throughout Namibia, but are now mainly found in Etosha National Park, Kaokoland, the Caprivi Strip, Kavango and Bushmanland. Other small populations exist in the Namib Desert, and within the Skeleton Coast National Park. It`s actually just the Brown Hyena (not illustrated) that`s famous for its strange howl, which resembles a hysterical human laugh and despite several visits to Namibia, I`ve yet to see this species in the wild. The Browns are predominately scavengers but their diet also includes a wide range of small mammals, birds, reptiles, fruit and insects. 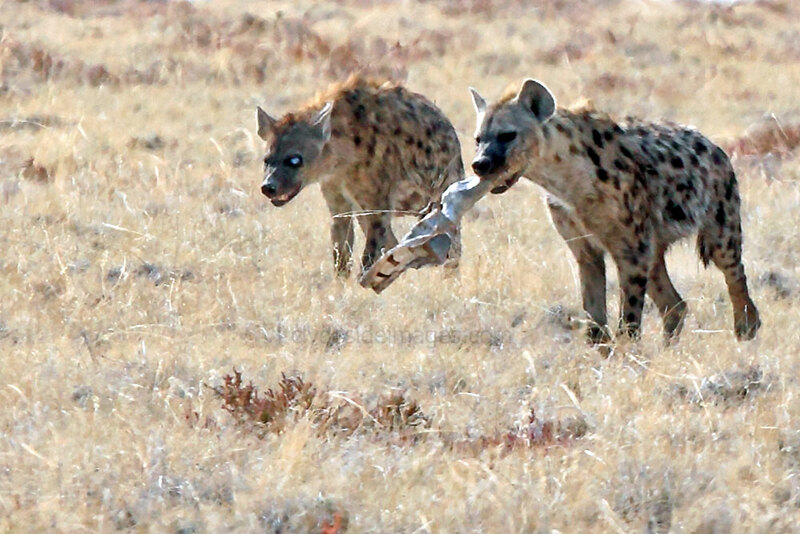 ​Spotted Hyenas in particular are efficient hunters with very powerful jaws​. Females are larger than the males and clans of hyena are led by dominant females. Adult hyenas can run at speeds of up to 60km/hr and their power is well illustrated when an individual is seen running off from a kill carrying the hind leg of a Wildebeest, Zebra (seen here) or other heavy section of a carcass, high off the ground with ease. ​This pair, one of whom appeared to be blind in one eye, were charging across the plains near the Halali Plains Seeps in eastern Etosha. The milky eye gave the individual a pirate-like appearance, reminding me of the baddie hyenas in Disney`s Lion King movie. The Black-backed Jackal (Canis mesomelas) gets its name from the broad, dark saddle which exists on the upper parts of the body and this, along with a black, bushy tail and reddish flanks and limbs, distinguishes it from its close relative, the Side-striped Jackal. 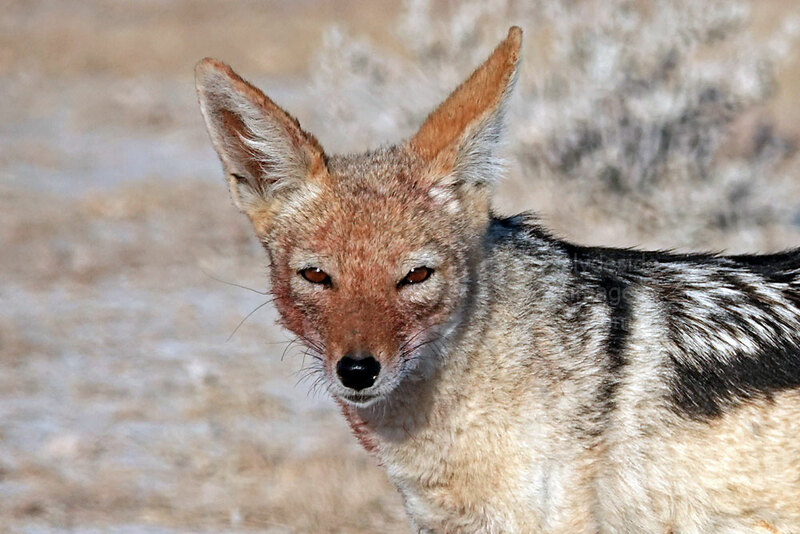 ​Black-backed Jackals are common throughout Namibia, including the Namib Desert although they aren`t quite as common in the extreme north-east of the country which is the only area of Namibia where the Side-striped are likely to be found. The latter species primarily dwells in woodland and scrub areas whereas the Black-backed Jackal favours more open terrain. Although these animals are efficient hunters, they rely heavily on scavenging for food. 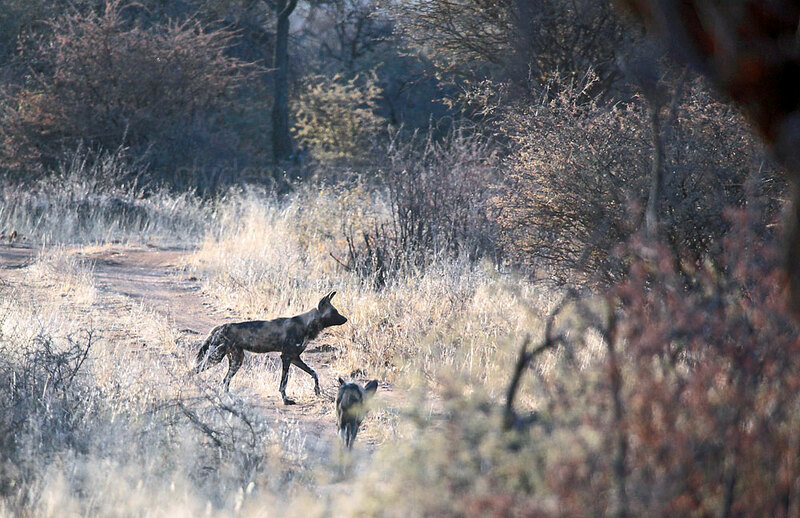 Black-backed Jackals will often be found around campsites searching for scraps and unattended food and there are tales of campers at Okaukuejo battling throughout the night to keep the animals away. Small items including shoes left outside tents or bungalows in Etosha overnight will likely disappear and it`s not uncommon to have a Jackal brush past your leg once darkness falls as they brazenly stroll about the camp. Although their diet mainly consists of carrion, they frequently take insects, birds, rodents and occasionally small antelope. They are also known to kill the young of sheep and goats on agricultural land if the opportunity arises. 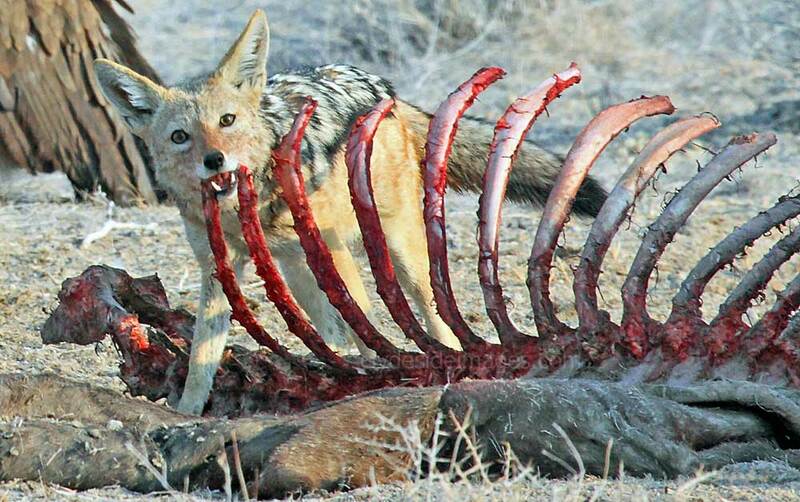 Black-backed Jackals are one of the few mammalian species that form long-term bonds. Females give birth in deep holes, often constructed with two entrances to provide a choice of escape routes. Litters of one to six, sometimes as many as nine, young are born from July - October, after a gestation period of about 2 months. 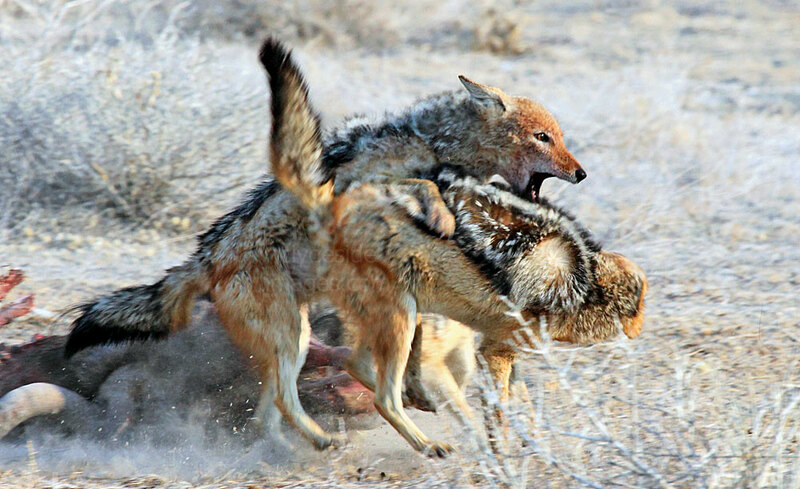 Both male and female Jackals take an active part in the rearing and feeding of their young. ​African Wild Dogs are classed as endangered by the International Union for the Conservation of Nature (IUCN) and it`s estimated that there are only around 6,600 adults left in the entire continent, the majority underdeveloped. ​The decline of these fragmented populations is ongoing, due to habitat loss, human persecution, and disease. ​This carnivore is actually a member of the dog family, and healthy adults usually measure in the region of 750mm at the shoulders with males slightly larger than the females. ​Each individual has a unique coat pattern, which makes it possible to identify every animal in a population with certainty. 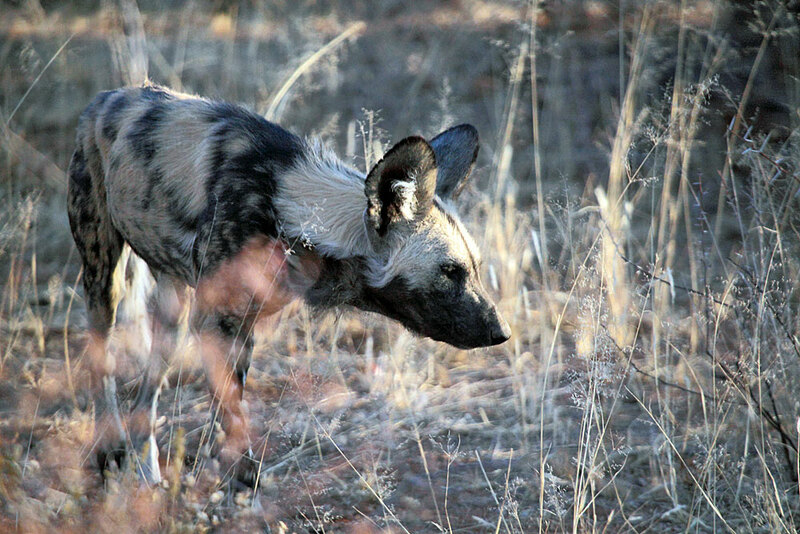 Known as the Alpha Pair, the dominant male and female are the only individuals to breed in a Wild Dog pack. ​Other members forego the right to breed and confine their role to helpers. As large litters of 12 or more pups are born, the female cannot suckle offspring for too long so, from the age of three weeks, milk is supplemented with regurgitated meat brought to the pups by other pack members. Litters are safeguarded in burrows. ​Wild Dogs hunt in packs, when all members will collaborate in a team effort to chase and wear out their intended prey to exhaustion. ​Small to medium-sized animals are usually targeted with Impala being favourite, however, in East Africa Wild Dogs have been known to hunt prey as large as Wildebeest and Zebra. Once the animal is brought to a standstill, the pack moves in and tears the unfortunate creature apart. 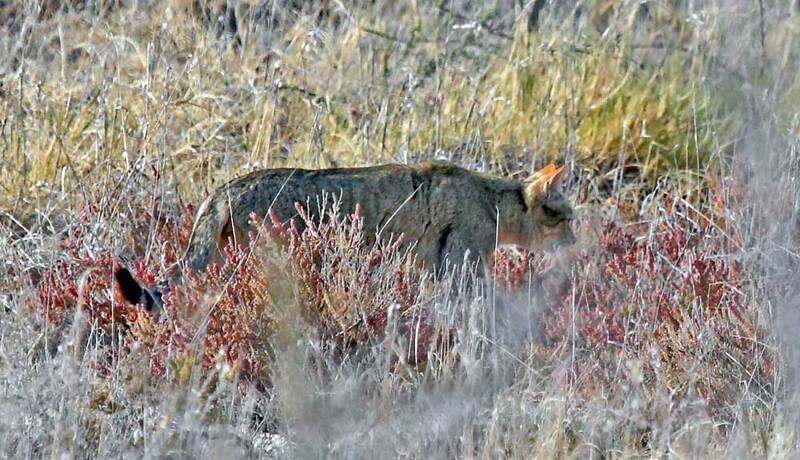 In some areas the predators do take livestock, but this is a fairly rare occurrence. I took these shots on the Okonjima Nature Reserve while out of safari looking for Cheetah, however, the Wild Dogs are no longer kept there. 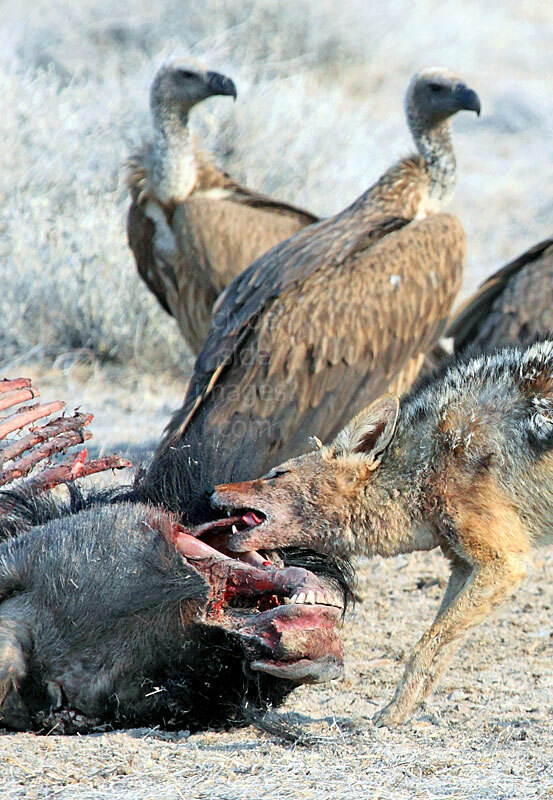 Witnessing a kill is fascinating but never pleasant but the method employed by the Wild Dogs is particularly savage and drawn out, causing the unfortunate victim a great deal of prolonged agony, therefore staff took the decision to relocate the animals as they realised that it may be too distressing for some visitors to witness such a spectacle. ​African Wild Cats are almost entirely nocturnal creatures and are adept at climbing trees when hunting or if placed under stress. During my first visit to Etosha National Park I got a rare glimpse of one of these reclusive felines on the hunt near Suedo, a small spring-like channel on the Pan`s southern edge. Diet mainly consists of rodents, with mice and gerbils a particular favourite, but they are also partial to medium to small-sized wild birds, poultry such as ducks and chickens, plus hares, reptiles, frogs and insects. The only Small-spotted Genet (Genetta genetta) I`ve seen was at the Erongo Wilderness Lodge when it came to the waterhole after dark. Although floodlit, the pool is quite far away from the terrace and my camera had a poor low-light capability so unfortunately I didn`t manage to get a usable shot. These small predators are widespread throughout Namibia, apart from the Namib Desert, but are strictly a nocturnal species resting up in holes until nightfall. The spots on the body are in general smaller than those of the Large-spotted Genet and it has a characteristic feature of the smaller species is a dark central dorsal band from just behind the shoulders to the base of the tail. They occur in woodland savannah, using the more open areas of woodland and dry grassland. Although predominately solitary, they are sometimes seen as a pair. Small-spotted Genets feed mainly on small mammals, amphibians, lizards and birds and they`ll even eat fruit. They are proficient climbers and if trees are present they will readily climb into the branches to wait in ambush.